According to a recent article published in JAMA, the United States is in the midst of a physician burnout crisis thanks to excessive workloads and increased clerical burden, among other factors. Many hospital systems and practices aren’t working to solve the problem, but what they often fail to consider is the financial loss that can come as a result. The economic costs of not addressing burnout are significant. Data shows that it can cost upwards of $1 million or more to replace one physician leaving because of burnout. What’s worse? That figure doesn’t include any additional costs associated with burnout. 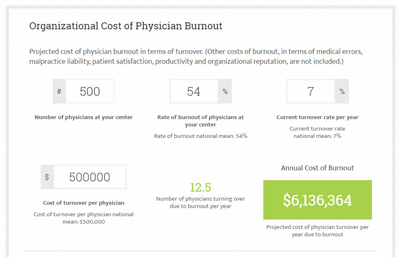 To help healthcare organizations understand the financial burden associated with physician burnout, the AMA used data from several studies to create an online physician burnout calculator. As an example, a hospital with 500 physicians and a 54% burnout rate, the national average, can expect to spend more than $6 million each year just to replace the physicians who leave because of burnout. Because physicians respond to burnout in other ways than just moving on to a new opportunity, the indirect financial costs can add up quickly. They may continue to work at the same place but work on a part-time basis or reduce the number of patients they’ll see in a day. That can add up to a significant amount of lost revenue for a hospital. Beyond just reducing productivity, some physicians may unintentionally respond to feelings of burnout by providing less safe care to their patients. It is common knowledge that care is safer when physicians are happy with their work and that safety hazards can be quite expensive. Yet another consequence of burnout is the impact on patient flow. Those that lose their physician or receive sub-standard care are more likely to choose to see a provider at another facility the next time. So instead of knowingly turning a blind eye to the problem, or dealing with it on a situational basis, healthcare organizations should take steps to measure the rate of physician burnout at their facilities. Using that information, they can better understand the cost of inaction, a figure that will likely be unexpected. While not every hospital or practice has studied burnout in their facilities or put plans in place to combat it, it is likely that many will soon out of sheer necessity. The more data that we can acquire and the more awareness that we can raise, the better patients will feel in terms of their care being delivered by physicians who come to work feeling energized and empowered, as opposed to uninspired or discouraged.